The Cleveland Browns have started their search for another saviour after finally ending the Hue Jackson era. Yet, for all the embarrassment the Browns suffered in Jackson's tenure, he is not quite the worst coach in NFL history. As the Browns move on with interim head coach Gregg Williams and search for the coach who will lead their young team in 2019, we look at the five worst coaches to have graced the NFL by winning percentage. Son of the legendary Don Shula, who owns the record for the most wins by an NFL coach, and brother of New York Giants offensive coordinator Mike, David was hired by the Cincinnati Bengals in 1992 but never led them to more than seven wins in his four full seasons in charge. He was fired seven games into his fifth year. Shula took a 22-year sabbatical to run the family steakhouse business before being hired as the wide receivers coach at Dartmouth College in 2018. Before an extremely talented Jacksonville Jaguars team realised their potential and came within a Tom Brady comeback of the Super Bowl last season, they had floundered under Bradley's stewardship. 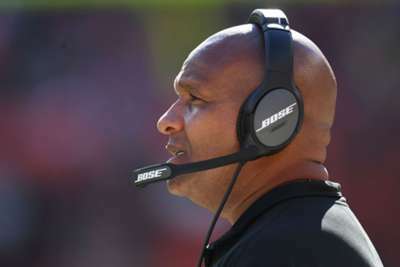 Having done a superb job as the Seattle Seahawks defensive coordinator, Bradley looked an astute hire in 2013 but won just 14 of his 62 games before being fired at the end of 2016. He landed on his feet, though, and is now the coordinator of a Los Angeles Chargers defense filled with stars. Spagnuolo was justifiably rewarded for helming the New York Giants defense that helped them stun the New England Patriots in Super Bowl XLII with the top job with the then St. Louis Rams. Yet the highlight of his dismal tenure was a mediocre 7-9 season – missing out on the playoffs through a tiebreaker in a terrible year for the NFC West. He won three games across his other two seasons in St. Louis. Spagnuolo served as interim coach for the Giants last year after Ben McAdoo's firing but won just one of his four games. Jackson was one of the hottest names on the coaching market when the Browns hired him in 2016. He impressed many in 2011 in his lone season with the Oakland Raiders, going 8-8, but never came close to that kind of respectability in Cleveland. Despite having the luxury of very high draft picks throughout his spell, Jackson took a Browns franchise far too accustomed to incompetence to a new low. A Christmas Eve victory spared him in a winless debut season but the Browns promptly went 0-16 in 2017. Jackson somehow held on to his job despite that humiliation but a comprehensive loss in Pittsburgh proved his last act. Bell bought the rights to the NFL's Philadelphia franchise in 1933 and christened them the Eagles. He became the sole owner in 1936 and austerity measures led him to take over from Lud Wray as head coach. He failed spectacularly, winning only 10 of his 56 matches before selling the Eagles and buying a stake in the Steelers. Bell oversaw two games as Steelers coach in 1941 and lost them both before being persuaded to resign. While success as a coach deserted him, what followed in 1946 was an extremely influential tenure as NFL commissioner. Having successfully campaigned for the implementation of the draft during his time as Eagles owner, as commissioner Bell brokered a merger with the All-America Football Conference, put together the league's schedule, strengthened the NFL's mass media appeal and paved the way for a players' pension plan. Bell is known to have uttered the famous phrase: "On any given Sunday, any team in the NFL can beat any other team."